Nick Bidwell's Notes from the Bundesliga: Hamburg discover some defensive steel. Nick Bidwell’s Notes from the Bundesliga: Hamburg discover some defensive steel. Hamburg hold in-form Dortmund to a goalless draw. Augsburg halt Wolfsburg's unbeaten run. Heiko Westermann had some choice words for his detractors after Hamburg's 0-0 draw with Borussia Dortmund. 1. Hamburg discover some defensive steel. Three weeks after slumping to an humiliating 8-0 loss away to an utterly merciless Bayern Munich, relegation-threatened Hamburg went some way to restore battered pride and confidence by unexpectedly holding in form Dortmund to a goalless draw at the Imtech Arena. Despite having to reshuffle early on when Swiss international defender Johan Djourou was forced off with a hamstring injury and losing the possession battle 32:68, the hosts were better organised and more focused than they had been all season, while Dortmund, who had won their previous four, never really got into their constructive stride, only rarely able to play in superhero attackers, Marco Reus and Pierre-Emerick Aubameyang. The critics and the idiots can lick my a***. If they can do any better, they should come and tell me, ” roared the former German international. 2. Köln finally prevail at home. Following seven home games without a win – the last coming way back in mid-October against Dortmund – Peter Stoger’s side finally broke their Rhein Energie Stadion hoodoo with a fully-deserved 4-2 victory over Eintracht Frankfurt, who for reasons best known to themselves have not come out on top in this part of the Rhineland for over a decade. Up until this weekend, the Kölner had only managed a paltry five goals this season as Bundesliga hosts. So what a thrill to almost net as many in 90 minutes, the fever pitch excitement prompting Nigerian striker Anthony Ujah to celebrate his goal by vigorously pulling the horns of the club’s billy goat mascot, Hennes. 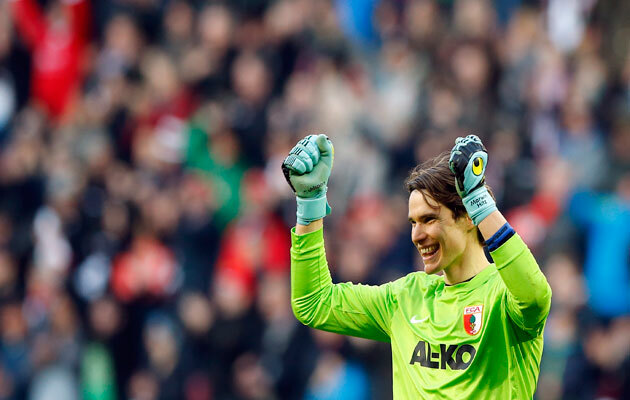 Augsburg’s goalkeeper Marwin Hitz celebrates after the 1-0 win over Augsburg. With flavour of the moment Wolfsburg undefeated in 2015 and Augsburg winless in four, the former were widely-expected to run riot on their visit to the shoestring Bavarians on Saturday. Thankfully, though, football is not an exact science and while vastly inferior to their opponents in terms of both star names and financial backing, the home side still managed to walk away with all three points, young midfielder Dominik Kohr on hand to side-foot home the only goal of the game after Tobias Werner’s penalty had been parried by Diego Benaglio. An excellent sixth in the table, Augsburg would qualify for the Europa League if the championship ended today, but all coach Markus Weinzierl wants to talk about right now is achieving his aim of avoiding relegation. Some 28 years since controversial Köln and Nationalmannschaft goalkeeper Toni Schumacher claimed in his autobiography that certain Bundesliga players were taking drugs, the issue of chemical corner-cutting is again on the agenda. A recently-released report into doping in the German game sensationally alleged that in the 1970s and 80s, anabolic steroids were used in “a systematic manner” at Stuttgart and to a lesser extent at Freiburg and needless to say, it’s caused an almighty stink. Bundestrainer, Joachim Löw, who played for both clubs in that time period, already has issued a unequivocal denial and so have ex-Stuttgart stars, Karl-Heinz Förster and Karl Allgöwer. Expect this messy business to run and run. 5. Bielefeld strike a blow for the minnows. Next month the quarter-finals of the DFB Cup will feature seven Bundesliga teams and one, Arminia Bielefeld, from the third tier. As recently as 2009 in the top-flight, Bielefeld have known nothing but heartache these past few years. But under coach Norbert Meier, they clearly are on the rise once more, not only topping their domestic league, but also emerging as everyone’s favourite cup giantkiller, beating Hertha Berlin on penalties in the second round and following it up with a memorable 3-1 victory last week over a rejuvenated Werder Bremen. On April 7/8, they face Gladbach in the quarter-finals and given the bravery and enterprise the Blues have shown so far, a hat-trick of scalps is by no means out of the question.